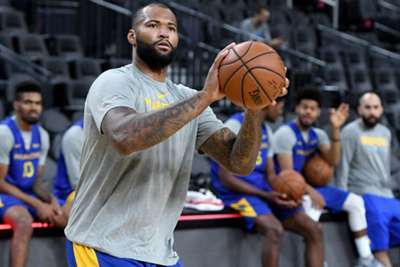 Golden State Warriors center DeMarcus Cousins is making "good progress" as he recovers from a torn Achilles tendon. Cousins – a four-time All-Star who joined the Warriors in free agency – suffered the injury in late January and missed the remainder of the 2017-18 season. On Monday, the Warriors provided a positive update on the 28-year-old as he waits to make his Golden State debut. "DeMarcus continues to make good progress with his rehabilitation program," Golden State's statement read. "After spending the last few weeks doing various individual on-court activities and drills, he will, in the near future, be integrated into controlled aspects of team practices, although not scrimmages at this point. "Additionally, he will continue with his off-court strength and conditioning." Cousins averaged 25.2 points and 12.9 rebounds in 48 games for the New Orleans Pelicans before signing a one-year, $5.3million deal with Golden State in the offseason. He told reporters in late September his "drive has only increased" since he last suited up for a game. "I think you guys will see a new DeMarcus on the floor," Cousins said. "I can't wait to get to that point just to show all the work I have put in, into this injury. I think you'll see it when the product is on the floor."